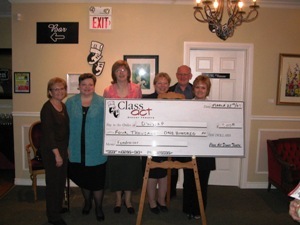 Our 3rd annual fundraising event was held on Sunday April 13th at Class Act Dinner Theatre. The live play, "The Foreigner" was very entertaining, the buffet was absolutely delicious and the door prizes were fantastic. Class Act donated $30 from each ticket back to DWWAP. We had a sold out show and raised $ 6,330 which went directly towards our operational costs. Thank you so much to everyone who contributed, and to Class Act for a fantastic afternoon. Quick Quality Printing(Whitby), Wal Mart (Oshawa), A&P(Whitby), Durham Swimwear(Oshawa), Mongolian Grill(Whitby), A Treasured Memory(Uxbridge), Mary Kay Cosmetics(Sue Colpitts, agent), PartyLite Candles(Loretta Kelly, agent), Jems by Janice(Janice McHaffie), Fashionable Accents (by Constance Lockwood), Avon (Inge Jabusch, agent). We also would like thank the Toronto Maple Leafs, Toronto Raptors and the Toronto Blue Jay organizations for their generous door prizes. A special thank you to our many DWWAP instructors and participants who provided wonderful door prizes as well for this very successful event. 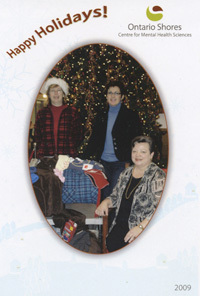 This year was another outstanding demonstration of the good will of the season by our participants and volunteers. 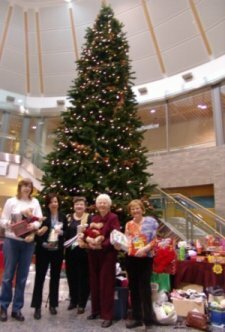 The collective DWWAP group outdid their contribution from last year and WMHC was overwhelmed when they saw the large amount of donations from our group. Thank you to the many that helped to make this undertaking such a huge success again this year. Our major fundraising event was on Sun. March 25th at Class Act Dinner Theatre at noon. The live show, "My husband's Wild Desires Almost Drove Me Mad', gave us all quite the laugh. 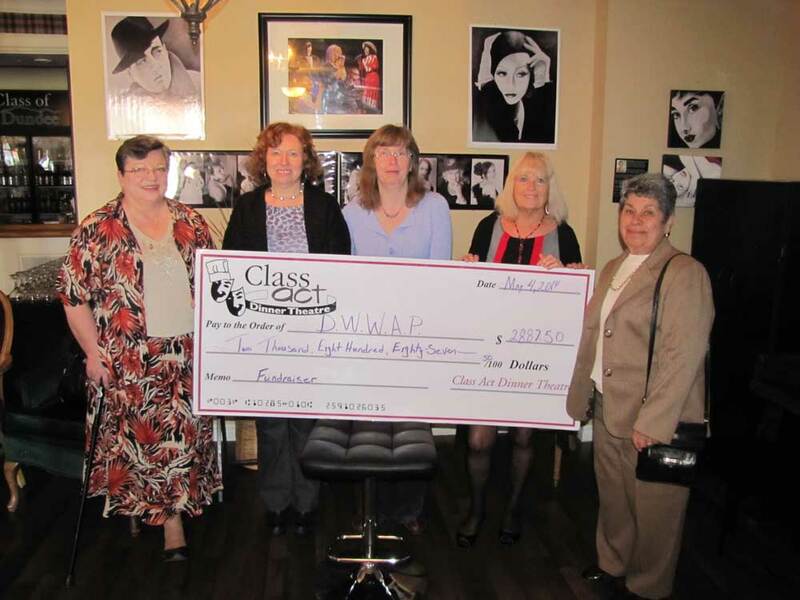 Class Act donated $22 from each ticket back to DWWAP. Last year we raised $3,700 towards operational costs, this year we raised $4,100! Thank you to everyone who contributed, and to Class Act for a wonderful show. DWWAP hosted a community forum with Dr. Alison Bested on February 17th, 2007. 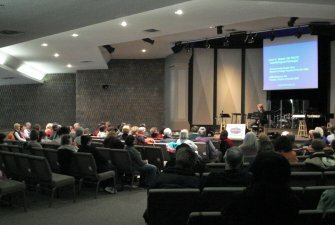 She shared invaluable information for persons living with fibromyalgia, chronic fatigue syndrome and chronic pain in an interactive setting. Dr. Bested discussed her new book, Hope and Help for Chronic Fatigue Syndrome and Fibromyalgia and especially when and where people should seek help. 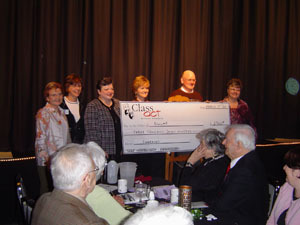 A cheque presentation in the amount of $3,700 from Class Act Dinner Theatre to DWWAP for the fundraiser held March 19, 2006. 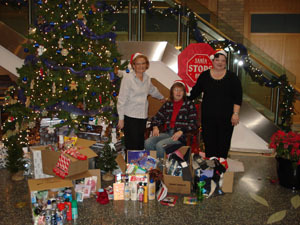 DWWAP's contribution to Whitby Mental Health Centre stocking stuffer drive was a big success due to the generosity of our participants. 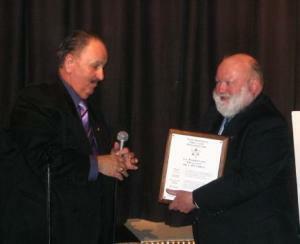 Ontario Trillium Foundation's plaque presentation to Founding Chairperson, the late Doug Hird. DWWAP was fortunate enough to receive a two year grant from OTF in 2005 in the amount of $73,200.